"AutoLayer is an elegant solution to a long avoided problem. Our standards manual used to have a section in it that was 18 pages long. Now it's down to one page. As a CAD manager, I can't tell you how great this is. ArchMedia fixes the layering standards problem for less than the cost of a good bottle of wine, and the solution is nearly as enjoyable. I would suggest this product to anyone." "I use the AutoLayer program and love it. AutoLayer has helped to standardize my layering system and I look forward to expanding it's use." 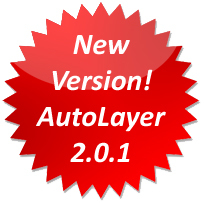 AutoLayer is a Layer manager system that provides consistent layer standards for the office. Company standard layer names, color, linetype and lineweight can be selected from AutoLayer and quickly inserted into the current drawing file. Multiple selection groups of layers can be inserted at one time. AutoLayer is a simple yet highly useful utility that has proven to be effective in Layer Standards Management. Quickly defines and updates layer standards. Export/Import Company Layer Standards to your design team and other companies that use AutoLayer! Multiple selection of layers can be inserted with one click. Unique Admin layer function buttons are only enabled if the user has write permissions to the AutoLayer program folder (i.e. Network folder). AutoLayer includes predefined layer groups based on AIA/NCS layer conventions. Simple interface that requires little or no training for the end user.